PV1 wrote: Although it's not a demanding task, I picked up a new Thule bike rack yesterday. I'm going to Pittsburgh for a bike ride with some friends, so I'm finally making use of my "accessory" hitch. I went for a quick test drive around the block last night, and only felt a little extra tug at the back when going over a drop in the pavement. Other than that, didn't even know it was back there, and my eBike weighs 50 lbs. I replaced my generic camlock cargo strap for the hatch with the Trunk Buddy. Made in the USA by mentally disabled workers, it has a specialized safety hook and loop for locking in the latch, plus it stores away more compactly. Recall from earlier in this thread; you may simply press a hook into the hatch latch, and hook the other end to the steel eye above the bumper that the hatch latches to, then pull 'er snug to carry oversized loads. For your utilitarian considerations, here's a 50" box containing a 55 gallon aquarium and all accessories slid in neatly behind my blushing bride. We got the usual sideways glances when I stopped the flatbed cart behind MR BEAN and opened the hatch, but of course it slid in quickly and easily. jray3 wrote: For your utilitarian considerations, here's a 50" box containing a 55 gallon aquarium and all accessories slid in neatly behind my blushing bride. Nice pic and great deal! Now what's that aluminum foil doing in the right rear wheel? Phximiev wrote: Nice pic and great deal! Now what's that aluminum foil doing in the right rear wheel? You probably also noticed last winter's dry-erase markings on the rims "OFF LF" etc. Amazing how that wipe-off marker persisted through an entire wet winter and a single automated car wash since the snow wheels went on in November... Guess I'll have to give them rims an honest washing before storage this year. I've been thinking about getting a new TV, but I don't want to pay for delivery. So, I measured the available space in the car, then went around measuring boxes in Best Buy. I think I might just barely be able to fit in a 55", but it'll be tight. wmcbrine wrote: I've been thinking about getting a new TV, but I don't want to pay for delivery. So, I measured the available space in the car, then went around measuring boxes in Best Buy. I think I might just barely be able to fit in a 55", but it'll be tight. I recently bought a 55" LG TV, and wanted to take it home right away. Unfortunately the box was about 3" too long, so we had to come back the next day in the old Prius. My car is a narrow one, so your extra width may help out here - here's hoping it fits. Finally built my solar range trailer ! 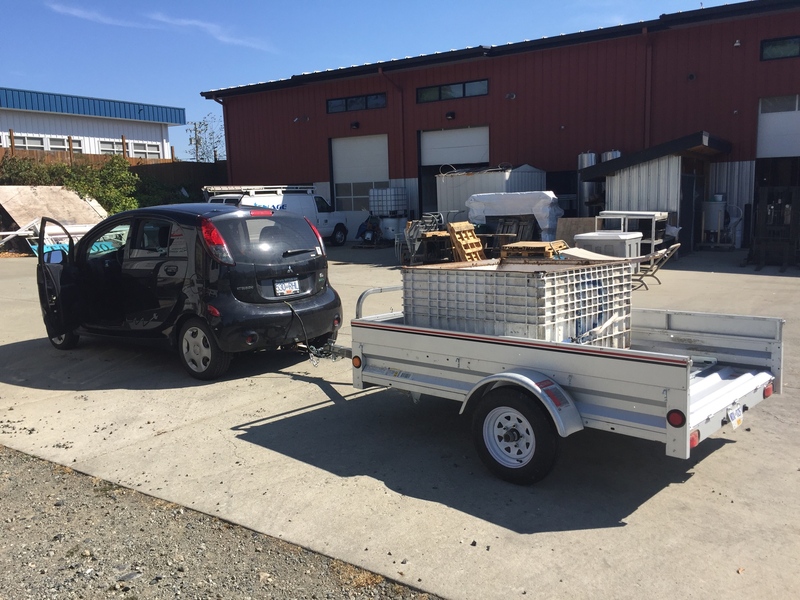 The trailer was empty, but weighs 3600 lbs. Nice Jray, that must have been fun and I'm sure you impressed a few people. I finally installed a wiring harness using Ben Nelsons instructions. I have been wanting to ever since my neighbour brought home a utility trailer and said I was welcome to it. This is a load of organics from the brewery I work at. I'd say the load was 6-700 lbs not including the trailer. I Hauled it 40 km home on the hwy at 90-100km/hr. Normally I use 6 bars going home and for this trip I used only 9. Had no trouble up hills, had lots of regen down and it worked great. This trailer had a fold down ramp at the back that sticks up alot higher than the sides and I used 12 bar hauling it to work empty where I usually use 7. On the way home I folded it into the trailer and used less power pulling it loaded than empty! Goes to show how big an effect air resistance has on range. Its great to see people using the i to its true potential. The hitch really is a lifesaver. I have a few pictures of my i doing its part to haul some things, including a stack of solar panels that now help power it.